In the startup community, Product Hunt is regarded as the place to kickoff your product and get it in the hands of thousands of users. With a carefully regulated upvoting system, Product Hunt ensures the community decides whether a product will rise through the ranks on the front page or fall below the fold. But we weren’t interested in Product Hunt only as a way of marketing our product and adding thousands of users to our email network. Product Hunt had a more important purpose for us. Xtensio is geared toward entrepreneurs and startups, so for us, Product Hunt was THE place to get feedback from the RIGHT users. We were first “hunted” (listed on Product Hunt) in November 2014. At the time, Xtensio was just a website with a simple premise: Xtensio will help you visualize your business profile in under 15 minutes. Our goal at the time was to gauge whether there was interest in Xtensio. And there was. Xtensio received upvotes in the double digits, confirming an existing market for our product (then we were in a “stealth” mode until our public launch). Over the next five months, we onboarded 500 users from our closed-beta signups, took note of their feedback, and made changes before pushing a public beta platform on April 30. Within the first few weeks of this launch, traffic to Xtensio.com reached anywhere between 200 and 2,000 unique visits a day, converting at an average rate of 17%. Not bad. Following this positive response from public beta users, we decided it was time to test Xtensio again on Product Hunt. We were officially featured on Product Hunt at 8am, May 21. At the end of the day, we held the second spot with over 600 upvotes. And how did that translate to actual users? On May 21 alone, we had over 4,600 unique visits to Xtensio.com with nearly 600 new sign ups. Pretty good traffic with an okay conversion rate of 13%. Landing such a high spot our first day on the site meant we would be featured on the day-after newsletter and stay longer on the front page. In the next few days, the traffic on Xtensio.com stayed about the same– we actually got MORE sign-ups on May 22. The conversion rate jumped from 13% to 15%. Now, nearly two months later, Xtensio has gained over 730 upvotes on Product Hunt. So what did we gain from our Product Hunt feature? Once our spike in traffic settled, we continued to maintain a healthy stream of visitors every day, with a conversion rate of about 20%. Pretty good. Of all users that joined following our feature on Product Hunt, 51% have returned to edit their pre-existing folios or create new ones. And of those users, 12% have become power users with more than 10 sessions on the platform. Our users are not only finding value in Xtensio, they’re coming back and quickly becoming brand advocates. Over 300 users have voiced opinions via Intercom’s in-app chat. We received hundreds of Twitter mentions and nearly a dozen user-generated blogs and reviews of Xtensio. The feedback has been overwhelmingly positive. Our users’ comments and concerns validate the need for Xtensio. Their suggestions demonstrate a willingness to shape the direction of our product. Many users shared the same questions and suggested similar features. Feedback trends have helped us decide what to prioritize as Xtensio moves forward. Some users even assumed our service was paid and asked where to input their payment information! And that’s very much NOT the case (for now anyways). And now for the most surprising effect of our feature on Product Hunt: Xtensio not only gained new users, but also received inquiries about integrating Xtensio’s products and features with other companies’. It became clear that Xtensio is no longer just a B2C (Business to Consumer) company, it’s also becoming a B2B (Business to Business) company. Product Hunters are not only excited to share their own products, they are also willing to try out others’, provide feedback, and become advocates for promising new companies. From our Product Hunt feature, we received a healthy surge of new users, gained valuable feedback, and discovered B2B opportunities. We’d like to give a special shout out to Bram Kranstein for “hunting” us, and of course, the Product Hunters who are helping us shape Xtensio. The feedback and engagement we’ve seen is enough to keep us going — to assure us we’re headed in the right direction toward finding our market fit. We have a lot more in store for Xtensio and can’t wait to continue sharing our growth with users. To learn more about the buzz around Xtensio, check out our Community page. 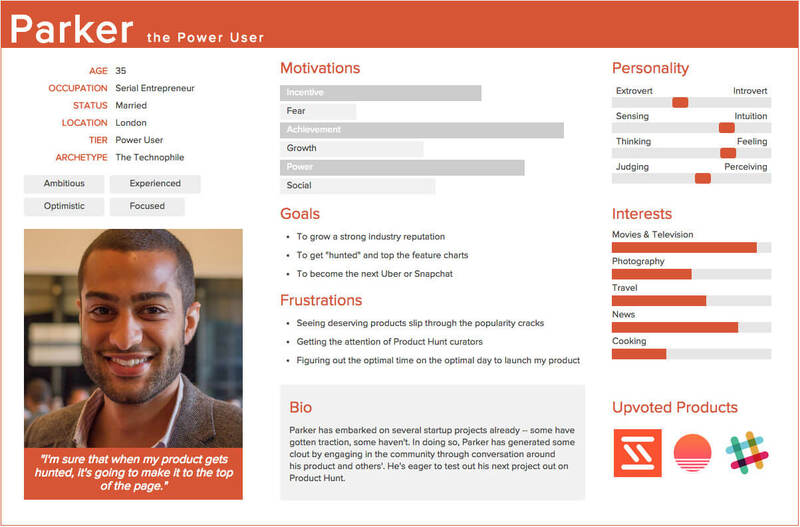 Using Xtensio’s User Persona Creator, we created hypothetical personas of two types of “Product Hunters.” We analyzed our Google Analytics traffic during the week of our Product Hunt feature and generated personas for the casual user vs. the power user. Disclaimer: these are more conceptual demonstrations rather than scientific ones. Basically — don’t take them too seriously 🙂 Click through the images to read them in more detail.